There's nothing quite like the soft, delicate skin of a baby. And nothing like a cranky infant irritated by diaper rash, cradle cap, or another skin condition. While your baby is perfect, her skin may not be. Many babies are prone to skin irritation in their first few months. Here's what you can do about it. Which conditions can you treat at home? How can you keep skin problems from happening? If some crops up, wash it with a warm cloth, and put zinc oxide cream on it. Baby "acne" is not really acne like the kind teenagers get. Research suggests it may be related to yeast, not oil. Pimples on a baby's nose and cheeks usually clear up by themselves in a few weeks. So you don't need to treat baby acne or use lotion. Lots of babies have these -- more than 1 in 10. 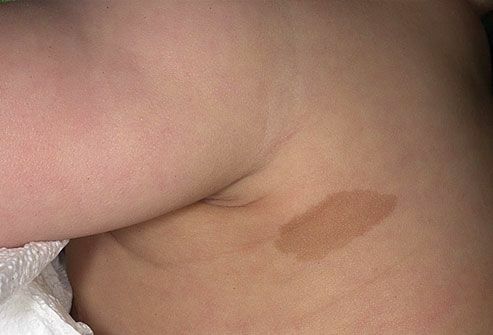 Birthmarks, areas of skin discoloration, are not inherited. They may be there when your baby is born, or they might show up a few months later. Generally birthmarks are nothing to worry about and need no treatment. But if your baby's birthmark worries you, talk to your pediatrician. It's an itchy, red rash that may happen in response to a trigger. The condition is common in children who have a family history of asthma, allergies, or atopic dermatitis. 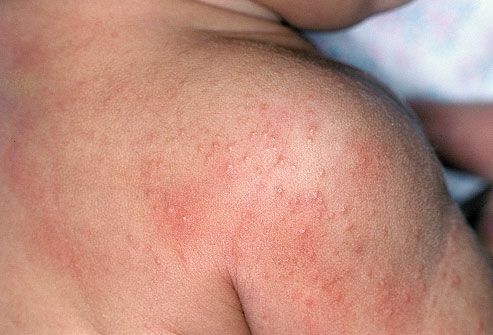 Eczema may appear on your baby's face as a weepy rash. Over time, it becomes thick, dry, and scaly. You may also see it on the elbows, chest, arms, or behind the knees. To treat it, identify and avoid any triggers. Use gentle soaps and detergents, and apply moderate amounts of moisturizers. More severe eczema should be treated with prescription medicine. You probably shouldn't worry if your newborn has peeling, dry skin -- it often happens if your baby is born a little late. The underlying skin is perfectly healthy, soft, and moist. If your infant's dry skin doesn't go away, talk to your baby's pediatrician. 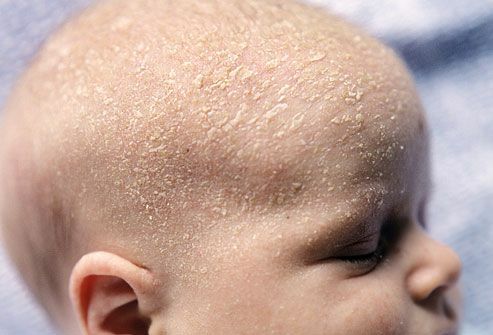 Cradle cap can show up during a baby's first or second month. It usually clears up within the first year. Also called seborrheic dermatitis, it's caused in part by too much oil. It shows up as a scaly, waxy, red rash on the scalp, eyebrows, eyelids, the sides of the nose, or behind the ears. Your pediatrician will recommend the best treatment for your child. That may include a special shampoo, baby oil, or certain creams and lotions. A cool, dry environment and loose-fitting clothes are all you need to treat it. Keep in mind that prickly heat can even be brought on in winter when your baby is over-bundled. Try dressing her in layers that you can remove when things heat up. Babies can inhale the very fine grains of talcum powder or the larger particles of cornstarch. That could cause lung problems. So it's best to avoid using them on your infant. 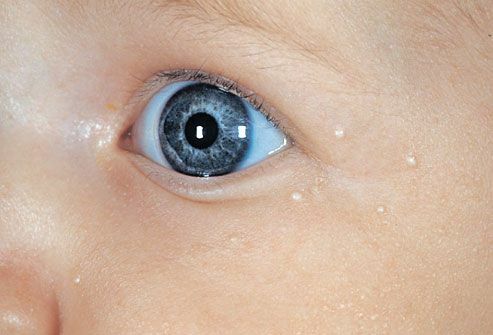 As many as half of newborns get little white bumps known as milia. Appearing usually on the nose and face, they're caused by oil glands blocked by skin flakes. 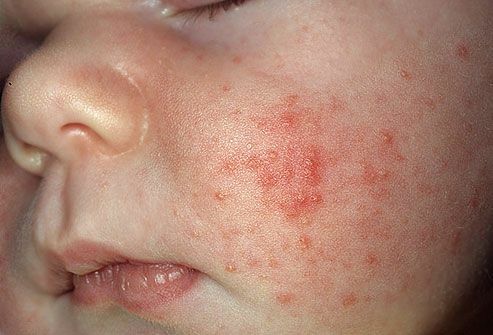 Milia are sometimes called "baby acne," but baby acne is related to yeast. Skin care for milia is easy: As your baby's glands open up over a few days or weeks, the bumps usually disappear and need no treatment. These often appear after your baby has had a round of antibiotics. They show up differently depending on where they are on your baby's skin. Thrush appears on the tongue and mouth and looks like dried milk. 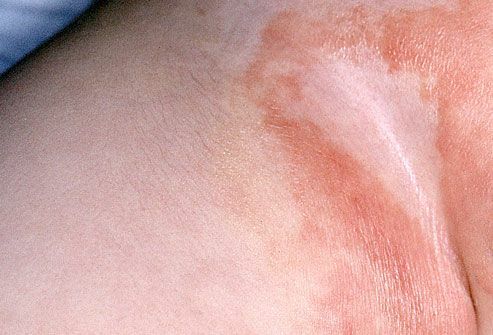 A yeast diaper rash is bright red, often with small red pimples at the rash's edges. Talk to your pediatrician: Thrush is treated with an anti-yeast liquid medicine. An antifungal cream is used for a yeast diaper rash. Avoiding skin rashes will keep your baby smiling and happy. Use a gentle detergent to wash everything that touches your infant's skin, from bedding and blankets to towels and even your own clothes. You'll cut down on the likelihood of itches or irritation. 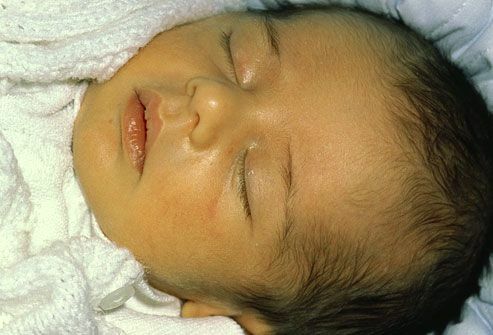 Jaundice is a yellow coloration of a baby's skin and eyes. It usually shows up 2 or 3 days after birth and is more common in premature babies. It's caused by too much bilirubin (a breakdown product of red blood cells). The condition usually disappears by the time a baby is 1-2 weeks old. Treatment may include more frequent feedings or, for more severe cases, light therapy (phototherapy). If your baby looks yellow, talk to your doctor. The sun may feel great, but it could be exposing your baby's skin to the risk of damaging sunburn. You can use baby sunscreen on infants at any age. Hats and umbrellas are also good ideas. 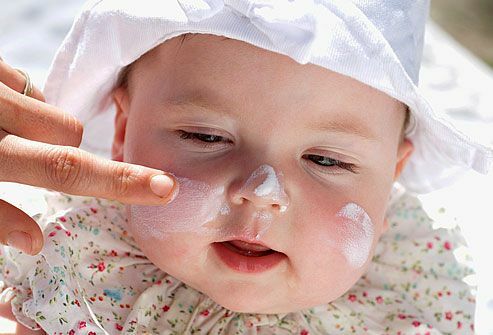 But for the best protection from sunburn, keep your infant out of direct sunlight during the first 6 months of life. For mild infant sunburn, apply a cool cloth to your baby's skin for 10-15 minutes a few times daily. For more severe sunburn, call your child's pediatrician. Apply sunscreen to the areas of your baby's skin that can't be covered by clothes. You can also use zinc oxide on your baby's nose, ears, and lips. Cover the rest of your baby's skin in clothes and a wide-brimmed hat. Sunglasses protect children's eyes from harmful rays. 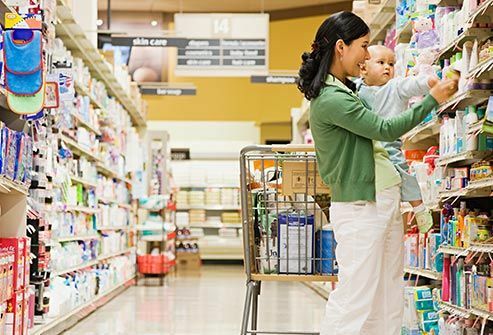 Shopping for baby skin care products? Less is more. Look for items without dyes, fragrance, phthalates, and parabens -- all of which could cause skin irritation. When in doubt, talk to your pediatrician to see if a product is appropriate. Remember, newborn skin is soft and sensitive. 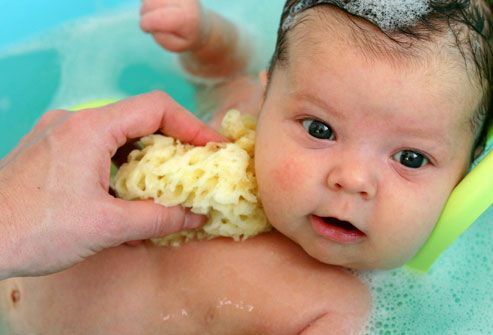 Keep your baby's skin hydrated by bathing her in warm water for only 3 to 5 minutes. Avoid letting your baby sit or play or soak for long in soapy water. Apply a baby lotion or moisturizer immediately after the bath while her skin is still wet, and then pat dry instead of rubbing. If rashes or other skin conditions are making your baby irritable, try baby massage. Gently stroking and massaging your baby's skin can not only help boost relaxation, but it may also lead to better sleep and ease or stop crying. 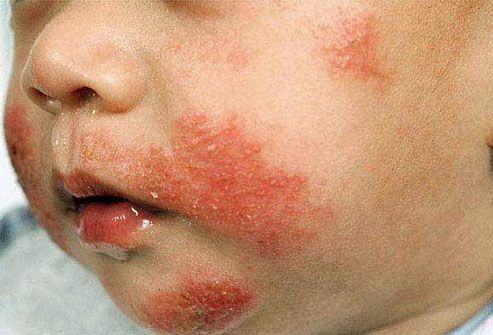 Most baby skin rashes and problems aren't serious, but a few may be signs of infection -- and need close attention. If your baby's skin has small, red-purplish dots, if there are yellow fluid-filled bumps, or if your baby has a fever or seems drowsy and sluggish, see your pediatrician right away. "Color Atlas of Pediatric Dermatology"; Samuel Weinberg, Neil S. Prose, Leonard Kristal; Copyright 2888, 1998, 1990, 1975, by the McGraw-Hill Companies, Inc. All rights reserved. American Academy of Dermatology: "Skin Care for Infants." American Academy of Pediatrics: "Fun in the Sun," "Parenting Corner Q&A: Sun Safety." 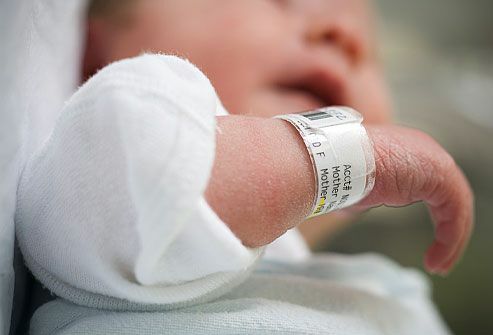 Children's Hospital, St. Louis: "Birthmarks and Your Baby," "Cradle Cap," "Baby Skin 101," "Jaundiced Newborn." The Cochrane Library: "Massage Intervention For Promoting Mental And Physical Health In Infants Aged Under Six Months."